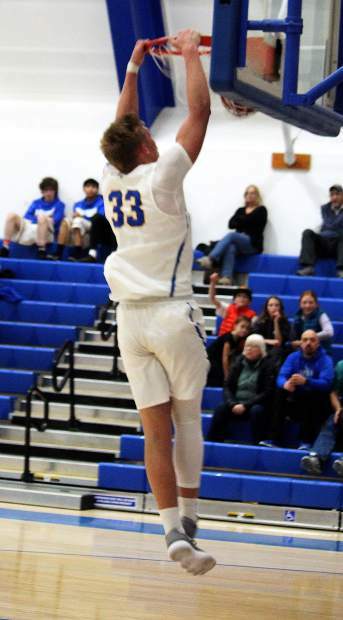 South Tahoe senior McCallan Castles dunks earlier this season. Playing basketball is in McCallan Castles’ blood. His mother, Alison, played division I hoops at Idaho State. She had a basketball in her son’s hands when he was 5 years old. Castles would go watch his older brother of two years at practice and longed to be on the team. He grew up with basketball. That was way before he picked up a football, the sport that helped him earn a full-ride scholarship to the University of California at Berkeley. He loves basketball every bit as much as football. Castles could have chosen to play basketball at a higher level. During his sophomore year while playing in Colorado before moving to South Lake Tahoe for his junior and senior seasons, he said he received interest from Eastern Washington, Weber State and the Air Force Academy in Colorado. Castles has South Tahoe playing at a high level. He is a team leader. And if he finds his range look out, the points are going to come fast. For his effort on the court, and in the classroom, Castles was named the Tahoe Daily Tribune’s Student Athlete of the Month. Finnegan has witnessed Castles catch fire and marvels at the site. He watches him pull up from long range and drain 3’s seconds apart. He watches Castles almost hurt the rim when the 6-foot-5 big man throws down break away dunks. Castles’ immediate concern is chasing a Northern League championship and that means winning a lot of games down the stretch. The Vikings are alone in second place, but three games behind the Elko Indians with six to play. The Vikings visited Elko Friday night, Jan. 26 (after press deadline). Leading up to the game, Castles said he hopes they can be the first team since 2012 to beat the Indians on their home court. Elko won the first meeting in December at South Tahoe.